I think I heard champagne corks popping last night around 9.50pm. I can only assume it was to celebrate the end of the awful past ten days where there has been nothing but international football to watch. The good news must be that means we're even closer to seeing our beloved Arsenal back on a football pitch sooner than we think. I've not seen any of the results apart from the England one - hard to miss unfortunately - and I did have the radio on for a while last night during the game (certainly better than watching it plus you don't have to look at John Terry) but it didn't sound like Theo Walcott pulled up any trees. A interesting statistic though was that the Arsenal player has only scored three goals for his country - the infamous hattrick in Zagreb in 2008. I suppose Walcott has other strings to his bow, but three years without an international goal for a player in his attacking position does seem to me to be too long. Anyway, I digress. In terms of Arsenal news there is little to talk about. The players returning from international duty don't start training until tomorrow but they will report back to London Colney in dribs and drabs today, depending on what times their different flights arrive. They have to see the medical staff to report any aches and pains, so let's hope there are very few of them. 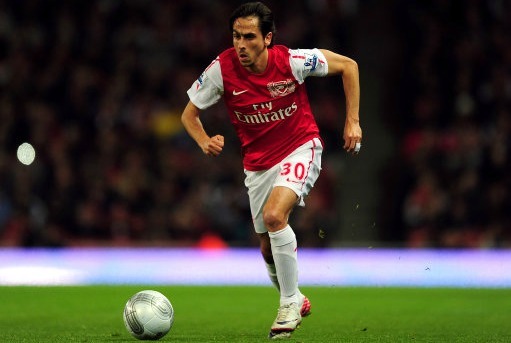 One man who wasn't involved with his country this time round was Yossi Benayoun, who the manager has been speaking about. "He is doing well at the moment. "The season is so long that he will play his part and I am convinced that he will be an important player for us. "His experience can make a big difference at some stage." Whist the Israel captain is yet to start a Premier League game for us this season, the real test of his credentials will come in January when Gervinho is at the African Cup of Nations. At the moment there doesn't appear to be a stand out choice to replace the Ivorian. Andrey Arshavin would slot into that position easily, but has been having an indifferent season. Tomas Rosicky is another who could play there, but again, he's not setting the world on fire. So then there is Benayoun who is returning from a season without football slowly and cautiously. The Israeli could slot into the left hand attacking berth with ease and make that position his own. What I've enjoyed about Benayoun's performances are his workrate and ability to get us going. He may not be everyone's first choice but to my mind is building up slowly. His experience of the game is also a bonus and something we've lacked in previous years, giving us the opportunity to see out games. There are a host of players who could come into replace Gervinho whilst he is away. But it's up to them to win the fight for that place. I don't think Arsene Wenger has a preferred option at the moment so in the next two months that spot will certainly be up for grabs. A player who is taking such a chance is Carl Jenkinson who is stepping in for the injured Bacary Sanga and he's loving every minute of playing for his boyhood club. I enjoy reading about our young right back and have been impressed with his performances so far for us. If he can learn from Sagna and keep up the hard work he'll need to put in at training, I don't see why he can't challenge for that position. In my eyes Sagna is the best in his position in the world. He's given very little credit and makes his job look easy. So if Jenkinson can emulate his team mate, we'll be in a good position for years to come. A few transfer rumours doing the rounds. Bordeaux president Jean Louis Triaud has revealed he's been tapping up Marouane Chamakh in an attempt to re-sign the player. According to the Daily Mirror, the French club are keen on cut-price transfer or loan deal for the striker in January. They also suggest Sevilla are interested. The Sun report we're contemplating a £10million bid for 23-year-old Toulouse midfielder Etienne Capoue. The former French under-21 international can play in the defensive midfield role or in the back four. And the Daily Star suggest we're keeping an eye on promising England Under-21 keeper Jack Butland. Chief scout Steve Rowley and goalkeeping coach Gerry Peyton checked out the 18-year-old in Stuart Pearce’s side’s 5-0 win over Iceland last week. The 6ft 4in Birmingham player could be available for a cool £1million. And finally, it appears Darren Dein is up to his old tricks again, placing a nicely anti-Arsenal piece in today's Guardian, this time around the club's attempts to renew the contract of his employer Robin van Persie. So many "facts" in that article stink for my liking. Samir Nasri was a cut price "£24m" ??? No, I think that was a steal! I'm not going to let it bother me. It annoys me that Robin has employed him but there is little which we can do about it and we'll have to put up with this rubbish until next summer when he decides whether he wants to stay at the club or move on. And finally... this time for real. Who would have thought the Dench man "Manny Frimpong" would be so bad at table tennis? Aaron Ramsey and Alex Oxlade Chamberlain reveal all.